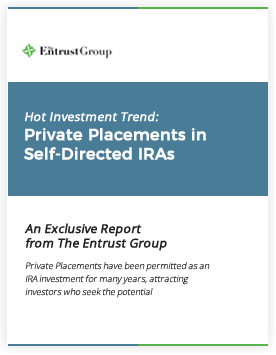 Private Placements have been permitted as an IRA investment for many years, attracting investors who seek the potential for higher returns, despite the high degree of risk involved. The definition of a private placement. How private placements work in an IRA. The rules that govern who can pursue private placements. Conducting due diligence on private placements. "20% of investors plan to increase exposure to emerging market stocks and private equity." The Entrust Group is the world's premier provider of account administration services for self-directed savings accounts, such as self-directed IRAs (gold IRAs and real estate IRAs), HSAs, and ESAs. For more than 30 years, Entrust has been an acknowledged authority in the field of alternative investments and administering self-directed, tax-advantaged savings accounts. [...] They run the gamut from a transfer from another custodian to the funding of an LLC to the sale of my holdings in the Hong Kong Trust. Your performance was so far above what I have come to expect (Keep in mind I had another account with another custodian until I got fed up with them) that I think it worthwhile to mention. I will be sure to recommend The Entrust Group to anyone that asks.